Resisting a fossil gas megapipeline in southern Italy: two years on. On 17 March 2019, in Puglia, in the south of Italy, local families, farmers, small business owners and council members marched to mark the second anniversary of their struggle – the day when they become the unlikely leaders of a peaceful yet determined resistance.They’re fighting to protect their land and community from the Trans Adriatic Pipeline (TAP). This massive fossil gas pipeline and terminal threatens their ancient olive farms, water sources, cultural heritage sites and stunning coastline. The people of Puglia keep standing up to the destructive fossil fuel industry despite the severe police repression, fines of up to €10,000 for their peaceful protests, and the forced expropriation of their land. Listen to Carmelo and Alessandro tell their story in their own words. The people in the region of Puglia in southern Italy are resisting a gas mega-pipeline on their land — the Trans Adriatic Pipeline — which would bring gas from Azerbaijan to Europe. For two years the communities of Puglia have organised, planned, petitioned, rallied, marched, danced, sang, and blockaded – showcasing great creativity, imagination and purpose to resist this destructive and unjust pipeline. From grandmothers to mayors, diverse groups of people have come together to take bold action. They are bravely engaging in peaceful protest, despite police violence, systematic oppression and the forceful expropriation of land. But the two-year anniversary also marks a new sense of urgency in this fight. The community’s steadfast resistance has lost attention from the mainstream media. National politicians have betrayed their campaign promise to cancel the project. And the EU and big banks are pushing forward with billions of euros in new financing. Newly emboldened, TAP and the fossil fuel companies behind it, are advancing construction day and night in Puglia. They are drilling, digging and laying kilometre after kilometre of new cement and steel piping – all of which is energy infrastructure that is incompatible with a livable climate. International support and solidarity is urgently needed. Now is the moment to organise and prepare to disrupt flows of finance to fossil fuels on a massive scale. A global wave of momentum against fossil fuel finance is building. Not everyone can be in Italy on the frontline of the resistance, but the banks which finance TAP and other new fossil fuel projects have offices and branches all across Europe. TAP, like other major fossil fuel projects, cannot go ahead without the backing of banks. By acting together, we can help to toxify investments in TAP and new fossil fuels. It’s time to disrupt the fossil fuel industry where they’re weak: by cutting off their access to finance. Our work is now more important than ever. Despite serious issues with the project, the TAP multinational corporation was able to secure a public-private financing scheme worth €3.9 billion in December 2018. But from the #FossilFreeEIB campaign to grassroots NoTAP groups across Europe, momentum is growing to defund fossil fuels. With most of the big banks very willing to talk about all they are doing for the climate, collectively they’re still funneling hundreds of billions of euros every year into new fossil fuel projects. Banks must commit to stop funding new fossil fuels, now. TAP is a clear example of how public and private financial institutions in Europe work hand in hand to enable the continuation of new fossil fuel development. In 2018, the European Investment Bank and the European Bank for Reconstruction and Development approved billions of euros in loans to TAP, essentially providing political and economic certainty for private banks to step in. In turn, the TAP multinational was able to secure a public-private financing scheme worth a whopping €3.9 billion, the largest investment deal for a European infrastructure project in 2018. In addition to the EIB and EBRD, three export credit agencies and 17 private banks are involved in the deal. Along with these bank lenders, TAP is being funded by its shareholders in the fossil fuel industry: BP, SOCAR, Snam, Fluxys, Enagas and Axpo. Listed below are all banks and agencies involved in providing the €3.9 billion TAP financing scheme. The Trans Adriatic Pipeline is the western leg of a chain of proposed pipelines known as the Southern Gas Corridor. Scheduled for operation from 2020, these pipelines would pump 10 billion cubic metres of gas from Azerbaijan to Europe, and 6 billion cubic metres of gas to Turkey, every year. Just when Europe could be investing in a renewable and fossil free future, the EU is pushing ahead with a major transition to gas — new fossil fuel infrastructure that could lock us into climate disaster — and the Trans Adriatic Pipeline is one of the flagship projects. Climate implications alone mean the TAP must not go ahead. Instead of rapidly reducing emissions as the Paris Agreement demands, TAP would lock Europe into fossil fuels for decades. Given that existing fossil fuel operations already exceed the carbon budget left to avoid catastrophic, irreversible changes to our climate, there is no justification for new fossil fuel infrastructure, especially on the scale of the Southern Gas Corridor. 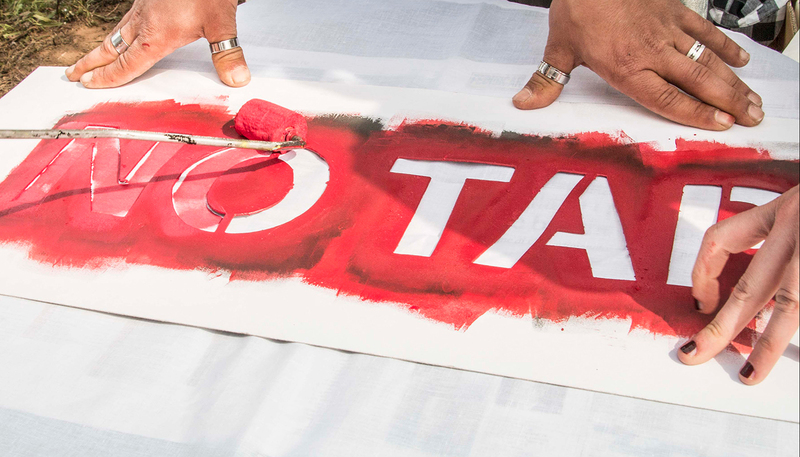 TAP already has unjust impacts on the many communities it would pass through, including Albania, Greece and Italy. In Melendugno, the ending point of the pipeline in Italy, the local ‘No TAP Committee’ is clear that this is an undemocratic project that will cause vast economic and irreparable environmental damage. Since its approval the construction of the pipeline devastated the local economy, natural landscape, and traditional way of life of communities in southern Italy. Two years ago, when works began to uproot hundreds of ancient olive trees to make way for the pipeline, a popular movement of thousands of people organised daily non-violent actions to stop the operations. This pipeline cannot be built without financial backing, so we also call on European public banks who are investing in it. The European Investment Bank (EIB) has invested 1.5 billion into TAP already. Now the bank is reviewing it’s energy lending policy and we are calling on them to abandon all fossil fuel investment and shift its funds to clean energy.